Sometimes it is easier to stay in the comfort of what you already know… to remain in a situation that is familiar. It is the easier, softer way. To some, change is exciting and refreshing, but to others (including me), it is frightening. Starting something new brings with it terrifying fear of the unknown and desperate uncertainty. But there are times when you just know that change will be good for you, even though you may be afraid of taking that first step. 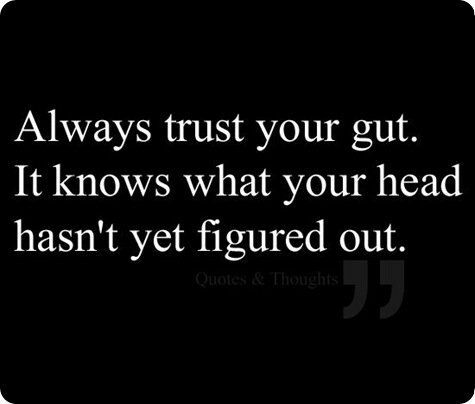 The older I get, the more I realize how important it is to trust what my gut is telling me. There have been days when my gut was screaming out at me… and I have chosen to ignore it. You may be able to relate to that gnawing feeling deep inside telling you that something just isn’t right… or that something is not working. Listen to it, because that feeling is coming from a place that we can’t even comprehend. Life is full of choices… choices to leave or stay… choices about people in your life… career decisions… you name it. We stress about these choices. Make lists of pros and cons. Ask all of our trusted friends. Lose sleep over these decisions. When all along, the answers are right there… deep inside our gut. Trust in that voice… let it guide you.